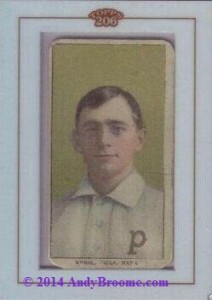 Starting back in 2002, Topps released pre-war buyback cards in their Topps T206 product. The idea was a good one, create a standard trading card sized frame with a transparent window and place an original, nearly 100 year old card in it and randomly insert them into packs. For some collectors, these would be their first pre-war experience. For other collectors, these would cause some headache. The frames protected the cards, although most were beaters. A low condition card inside a nice, clean frame caused some confusion when submitted for grading. While it may seem that the overall outside frame of the card would be where the grade comes from, and should get high subgrades, the idea is wrong. It is the card inside the frame that is graded, and it is graded under the Beckett Vintage Grading (BVG) standards. That means no subgrades. The headache for some comes from some genius (sarcasm) scammers that figured out they could slice the frames open, remove the low condition T206 and replace it with a fake of a more valuable, even rare variation card such as the one below. As you can see, this is supposed to be a rare “Magie” error card inside the Topps frame. Problem is, there were not high-dollar rarities purchased and used by Topps. The card is an obvious fake. It appears to be a laser printed image on a cardboard stock. Looking closer at the edges of the frame itself, there is glue seeping from the seam where the frame was glued back together. In person, it should be easy to spot. Online, not so much. In the case of an online auction, caution should be taken when a card of higher value is being offered in a buyback frame. Fortunately, I’ve only seen a small handful of these in over 10 years. But, as the card here shows, they are out there.